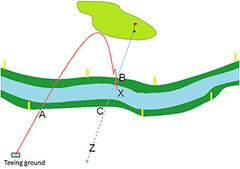 The diagram shows (in red) the line of flight of a player's ball from the teeing ground, which completely crossed over the water hazard but bounced back across the margin (at point B) and came to rest in deep water (at point X). a) Is the hazard shown in the diagram a water hazard or a lateral water hazard? b) May the player play their third stroke from the teeing ground even though they know their original ball is in the water? c) May the player, under penalty of one stroke, drop a ball within two club-lengths of point B, not nearer the hole? d) May the player, under penalty of one stroke, drop a ball anywhere on the line of flight from the teeing ground to point A? e) May the player, under penalty of one stroke, drop a ball between point C and point Z, or even further back along that same line? a) A water hazard, because it is designated by yellow stakes. b) Yes, option a) in Rule 26-1 permits a player whose ball lies within the margin of a water hazard to play another ball from where their original ball was last played, under penalty of one stroke. c) No, dropping a ball within two club-lengths, not nearer the hole, is only an option for taking relief from a lateral water hazard (red stakes and/or lines). d) No, the line of flight is not relevant to where the player may drop their ball in taking relief from a water hazard. e) Yes, option b) in Rule 26-1 permits a player to drop a ball behind the water hazard, keeping the point at which the original ball last crossed the margin of the water hazard directly between the hole and the spot on which the ball is dropped, with no limit to how far behind the water hazard the ball may be dropped.